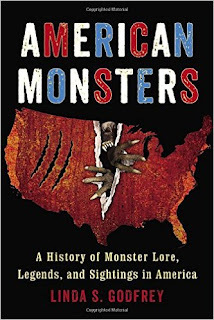 A lot of my paranormal reading this year has focused on cryptozoology and monster lore, and one of the BEST authors on this subject is Linda Godfrey. After thoroughly enjoying hearing Linda on the radio many times and reading her book, Real Wolfmen, I knew I would not be disappointed with this selection. I was right! Coming in at over 300 pages, this book is a little on the chunky side compared to most of the other paranormal-related books I've read recently, but at no point was it ever boring, or felt tedious to get through. Instead, I found myself pretty engrossed at the many different stories, often told from the perspective and in the words of the person(s) reporting the experience. The book is comprised of three major areas: beasts by air, by sea, and by land, or if you will, monsters that fly, monsters that live in the water, and monsters that walk on land. Linda covers just about every geographical area in the country, combining anecdotes, historical precedence and scientific (and sometimes, not so scientific) theory as to the nature of America's strange creatures. As with Real Wolfmen, there's a huge focus on Wisconsin, which I haven't yet determined means that Wisconsin is the most cryptid-rich state in the nation, or its just because that's where Linda lives! Either way, I'm not sure I'd want to be hanging out in the woods alone out there. Obviously, I recommend this title and think it would be a great addition to any paranormal library. 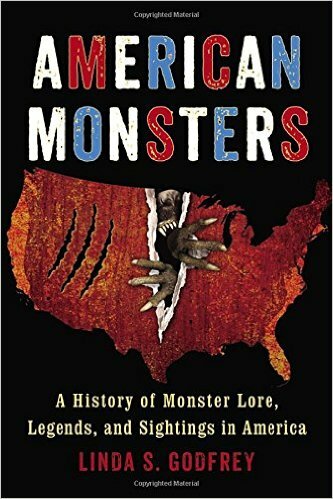 It's a wonderful overview of America's monster lore told in an interesting way with appropriate commentary where needed. It's a great collection of little known stories sprinkled with more documented cases and is a great place to begin research into this fascinating genre of paranormal study.